Here, at Freshome we always like to bring you home interiors and the designers who bring those interiors to life in your home everyday. Today, I had the opportunity to interview Lori Gilder, an award winning Architectural Interior Designer to Hollywood’s elite. From winning HGTV’s – ‘Designer’s Challenge’ to being featured as a guest designer on “Designing for the Sexes”, her projects are known worldwide as well as her features in design publications such as: California Homes, Spaces Magazine and Distinctive Kitchen Solutions. In our interview today, I asked Lori to share with us her top luxury decor tips, for those who are on a budget. After all, regardless of how large or small your design budget is, we all want beautiful homes! Homeowners today are always trying to make their home feel luxurious, but don’t always have the budget to fit their fantasies! What are your suggestions? It’s so true! Even in this economy, people have maintained their taste for luxury in spite of their budgetary limitations. But there’s always a little wiggle room when it comes to indulging – and adding a touch of luxury to any space doesn’t need to cost a fortune. For an instant infusion of luxury introduce a wall or two of exquisite wallcovering. From the most magnificent laser-cut patterns, flocked textures, subtle grasses, silks and metallics – the products available are endless – a little goes a long way. Add mirrors into your design scheme. I’m not just referring to wall hung mirrors – although they’re great – but introducing strategically placed mirrored surfaces into any room of your home. Reflective surfaces brighten a space and create that extra layer of sparkle, texture and luxury. A mirrored chest in the foyer or master bedroom, glass or mirrored tiled backsplash in the kitchen, or inset mirrored sections framed by paneling and molding to add glamor and sophistication in your living room. Luxurious towels are the ultimate indulgence that makes your bathroom an oasis. Get the feeling and look of richness by cocooning in some Egyptian cotton towels. The longer the loop the softer and more absorbent the towel. Display them if possible stacked neatly in an open shelf or on top of the bathtub decking. Luxurious metallic fabrics in silver bronze and gold layered with sheers are very beautiful and indulgent in formal living room and bedroom spaces. Keep it classic by draping these fabrics from a classic metal rod. Splurge just a little by investing in some of your favorite fabrics and trims to create those sumptuous accent pillows to sprinkle throughout your living spaces. Use contrasting fabrics on the reverse sides for greater flexibility and just flip them when the seasons change. As an award winning Architectural Interior Designer to Hollywood’s elite you have to be able to understand their style. What ideas can you give Freshome readers for adding a personalized style to their homes, while not spending a fortune? As a designer, understanding my client’s personal design style is as critical as decoding their design criteria. And the mission is to create a home that reflects the homeowner’s personal taste and style. (always respecting the home’s architectural integrity). So when it comes to personalizing your own home, I’d suggest you first take a look around your house for any repetitive themes, patterns and colors – then peek inside your closet to determine what your “style” is! Guaranteed you’ll see blaring similarities between your wardrobe choices and the taste you have in home decor. If you’re Country Casual: Infuse natural elements and splashes of color throughout your home coupled with those one-of-a-kind treasures found at antique markets, garage sales or thrift stores…and make them your own. Rustic accent tables, wooden photo frames and exquisite textiles can be used anywhere! For the Traditionally Classic personality: Re-arrange your furniture to create a symmetrical and balanced space, and purchase a pairs: like lamps, occasional chairs and accent pillows in subtle fabrics and textures. Add molding, wainscoting and beefy trims to create instant detail and architecture to an otherwise bland space. Use chair rails to divide walls in your dining room or down the hallway. Crown molding also adds visual height to ceilings. Then grab some of your favorite historical paint colors and get creative. For the Spirited Eclectic personalities: Showcase your precious pieces and collections that you’ve acquired while on those exotic vacations, to create that globally inspired look. For some great deals visit county antique markets. These are the best bet for collecting those bold textiles, rough fabrics and worn surfaces that show your personality. Only buy it when you fall in love with it! For the Cool Contemporary: Less is more! It’s sleek and chic all the way so start by de-cluttering your home. Get rid of all your old extra chochkes and replace them with more bold geometric accessories. There are fabulous Modern online sources with product to be had at great prices. You have been a featured designer winner on HGTV’s ‘Designer’s Challenge” and a guest designer on “Designing for the Sexes” – how do you factor in a clients small budget, while still delivering a “wow” factor? Creating a wow factor in any space is all about the unexpected –regardless of budget. It’s about creating an energy that embodies you as you enter a room. It can be as simple as painting your ceiling a deeper color than your walls, using reclaimed doors from a salvage yard as your headboard, or introducing a bright and colorful contemporary piece of art in a traditional space. Just one special detail can create a huge impact and give you the “wow” you’re looking for. Many homeowners think the interior of their home only needs attention. What is your advice for delivering beautiful curb appeal without overhauling the entire yard and their wallet? Proudly showing off your home’s exterior sets the stage for what’s to come and gives the impression that it’s loved inside and out. Punching up your home’s curb appeal doesn’t need to cost a fortune. It just takes a bit of creativity and some elbow grease. These quick fixes will make a world of difference! Clearly define a pathway to your front door. A path will draw in people, literally, and it will convey a sense of welcome. Create one with large stones, small rocks, or other natural elements or line the pathway with plants, shrubbery and lighting,. A landscaping overhaul is possibly the most effective way to improve your home’s exterior without spending a fortune. Update existing flowerbeds with new shrubs and flowers and add new planting beds along the driveway or the front of your home. For some added interest flank a large pot filled with your favorite flowers on either side of the front door. For an immediate transformation consider installing a new front door (with glass) that compliments the home’s existing architecture. If a new one is out of the question then give it a fresh coat of paint in a dramatic color, such as red or black, and replace the hardware. Create a welcoming glow with solar powered or LED lighting lining the pathway and driveway, which instantly accentuates your home’s façade. You’ll love the drama. Of course painting the interior or exterior is one of the quickest ways to achieve a facelift. If the paint on your house looks gray, cracked, or weathered it’s time for a fresh coat. And don’t forget the window trims, shutters, and fencing; even partial updates can make a big difference. You have a great video segment on your blog called “Lori’s Renovation Realities”. Can you explain why you created them, and how they can help homeowners seek inspiration? Lori’s Renovation Realities video blog series happened accidentally. At the end of shooting our inaugural series of videos for my blog – Diary of a Renovation, the conversation continued and we shared some hilarious and disastrous stories about the “realities” of renovating. Everyone has a story! So we re-loaded and shot some very impromptu Renovation Reality segments. They’re a lot of fun to share! Kitchens have the highest return on investment when it comes to renovating, but they also have a high price tag associated with them. Have you ever had clients that have budget challenges, but still want a beautiful kitchen remodel? How have you overcome the challenge? It’s true. 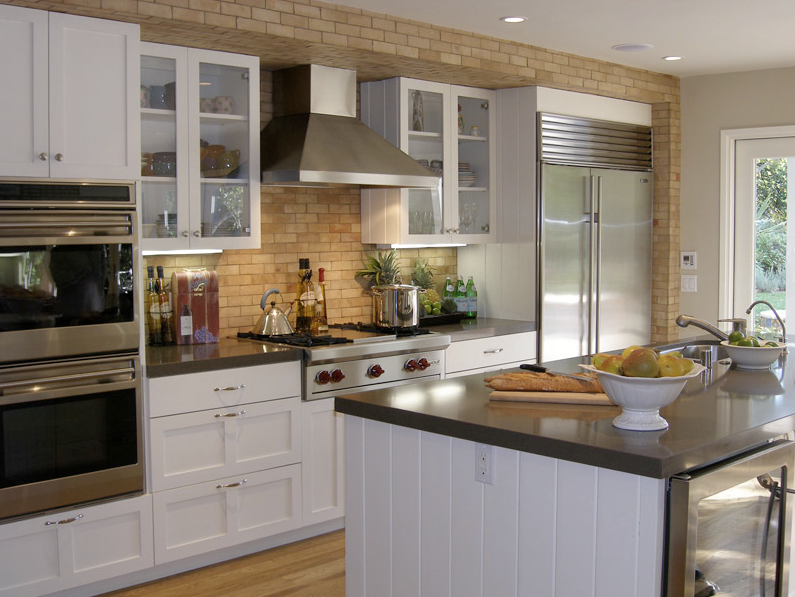 The kitchen remains the most popular home renovation project, an on average a kitchen remodel will yield a return on investment of anywhere from 75 to 100%. Whether large or small every client has a budget in mind – and its my responsibility as a designer to transform that space – and make it work and look like a million dollar kitchen. Having said that here are some cost cutting secrets to keep in mind when planning your kitchen remodel. ALWAYS have a plan in advance – with a good floor plan and lighting plan you’ll save valuable time and money. It’s well worth hiring a designer. Avoid moving existing plumbing and electrical locations (if the existing layout still works for you). Relocating plumbing and gas lines can be very costly. Resist the urge to buy top of the line appliances and shop around for more moderately priced stainless steel (if that’s your goal) equipment. Consider semi-custom cabinets rather than custom. Keep the sizes more standardized – rather than specialized. You can still achieve a high-end look for your kitchen – just do a little cost-comparative shopping online to find similar products and materials. Strategically blend both high-end and cost effective materials together to create high impact. A little of the good stuff can go a long way! What advice can you give to homeowners that want to bring the indoors out? Beautiful furnishings, plants, and outdoor decor can be expensive! How can Freshome readers cut the cost, but still achieve an outdoor oasis? I believe that extending a living space to the outdoors truly enhances our quality of life. Connecting with nature, breathing the fresh air and extending the summer season for as long as possible, helps us decompress and relieve our daily stresses. Creating an outdoor paradise can be as simple as dressing a terrace, with a simple table and chairs, or as detailed as building an outdoor living space complete with a gourmet kitchen, fireplace and seating lounge. Comfortable seating – in outdoor fabrics for easy maintenance. Simple trellis or pergola to provide shade and a natural canopy. Find some outdoor treasures in architectural salvage yards. Start a container garden – use recycled pots and fill them with an array of your favorite flowers, then position them all around your patio/garden. If you’re a handy one – build your own firepit. Provide some very simple outdoor lighting and lanterns sprinkled throughout to give you that gorgeous glow. Master Bedrooms are another area of a home that homeowners love to have luxurious fabrics, finishes, and furniture. What areas of the bedroom can you save money, and which areas should you splurge? The master bedroom should be our refuge where we relax, restore and rejuvenate at the end of the day – and creating that sanctuary requires you splurge on a few “Essentials”. A very high quality KING SIZE mattress! (The headboard, base or skirt can be quite simple). Luxurious bed linens. Invest in the best you can afford. There’s nothing better than sinking into Belgian or Egyptian linens at the end of the day. Ample storage is a necessity to eliminate clutter of any kind. Nightstands with drawers should provide you with ample surface area for fresh flowers, magazines and your current book. Create a warm and relaxing atmosphere with multiple light sources. Recessed fixtures, reading lamps or sconces – should be on dimmers and tri-lights. Install individual light switches on each person’s bedside. Paint calming peaceful colors such as blues, whites, creams, grays and taupes will provide that much needed serenity. Freshome would love to ask what you think of our website? We always try and inform and inspire our readers. What final tips would you give our readers in making their homes feel personalized and unique? Freshome does a fabulous job of providing design savvy homeowners with inspirational interiors, exteriors and products from around the globe. I Love the images and feel as though I’m on a World Tour of Dream Homes! Purchase quality pieces that improve with age and only invest in what you really love…paint your canvas over time!